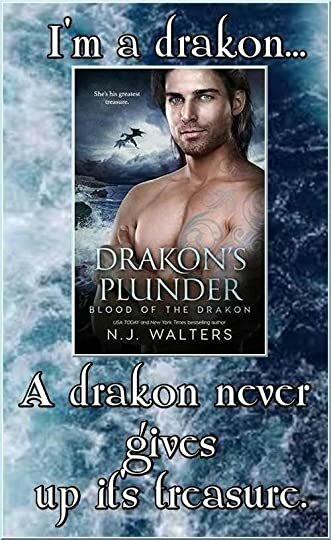 Water drakon Ezra knows just because he pulled an injured woman from the ocean, doesn’t mean he gets to keep her. But his dragon side has other ideas. The Knights are after Archeologist Sam Bellamy, but this drakon won’t give up his treasure. 4.5 - "Never doubt your value." Stars! We return to the Blood of the Drakon series, with the third book; Drakon’s Plunder finally giving us Ezra Easton’s story. This third installment of the drakon series left me captivated again with the world shrouded in mystery and danger that this author has created. Sam Bellamy is on a quest for justice. Her mentor was murdered by the secret society The Knights of the Dragons. She has been tasked to find artifacts on the reliant a ship that sunk. Sam nearly dies for doing the right thing. Absolutely fabulous! Loved the whole series so far. Love the different brothers and all their talents. Really strong heroines. Great, fresh premise. I've been dying to get my hands on Ezra's book ever since I finished Drakon's Prey in April!And I'm really glad I didn't have to wait too long! ***I choose what I read and review based on what intrigues me!! Yes, I got a review copy of this book, but no one tells me what to think, feel, or write about any book! I loved this book, so I bought it and the rest of the series to read! I have really been loving the Blood of the Drakon series, and book 3 is a solid addition to the story. I absolutely love this series!! It's amazing how you can fall in love with each brother but can't pick who you like the best. This book centers around Sam Bellamy and Ezra Easton. I am fast becoming a fan of this author and I absolutely love the concept of this series. Fabulous! Ezra is one of the four Drakons' brothers. He owns a salvage company and enjoys living on his own on his private island. Being a water Drakon, he is in his element when he is in and near the sea. First thing to say is that I didn't realise this was the third book in a series. Water Drakon, Treasure, Steamy Scenes and Humor, Oh My! I generously received this book in exchange for an honest review. This book was a pleasure to read and kept me on the edge of my seat. This is the 3rd book in the Blood of the Drakon series, and so far each book has concentrated on a different one of the four brothers this series surrounds - this is Ezra's story! Received an advanced reader copy from NetGalley for a fair review. This is the third book in the series Blood of the Drakon! Oh my gods what a book! I truly love this series by N.J.
ready or the next book. Sam Bellamy stood on the deck of the Integrity, a seventy-foot private research vessel currently anchored in the Atlantic Ocean about twenty miles off the coast of Maine. The waves were choppy and the wind brisk, but not too bad considering it was late November. She sensed someone coming up behind her but didn’t turn around. Best no one know just how hyper alert she was. “Whatcha looking at, Sam?” Aaron Dexter leaned against the railing beside her, getting way too close, as usual. He’d been hitting on her since they’d boarded the vessel. Aaron seemed to think he was God’s gift to women, and since she was the only woman around, it fell to her to be the recipient of his advances. Lucky her. She was used to being the only woman on board a boat, had spent her childhood fishing with her father and his crew, good, hardworking men who’d never given her any trouble. Her chosen career had taken her all over the world, from the deserts of Egypt, to the dense, humid jungles of South America and the mountains of China. She’d run from drug lords, smugglers, and slave traders. But being on this yacht just miles away from the coast of Maine was her most dangerous assignment to date. “What do you want, Aaron?” She kept her voice level and filled with disinterest. It was better not to encourage him in any way. He turned and leaned his back against the railing before giving her what she considered his patented seduction smile. She wondered if he practiced it in a mirror. She could have told him it was wasted on her. She’d rather date an alligator—full apologies to the alligator for the comparison. “Not a friendly sort, are you?” Rather than driving him away, her disinterest only seemed to be encouraging him. Not good. She supposed most women would find him good-looking, with his thick blond hair being ruffled by the wind and his dark brown eyes watching her intently. He was big and strong. That was his job. He was here ostensibly as security, and she knew he was watching her. “I’m here to do a job,” she reminded him. She was an archaeologist specializing in ancient languages and mythology. Her passion was ancient lore and magic, the things that most other scholars scoffed at. She was interested in mystical artifacts and creatures only whispered about in ancient texts and hinted at in paintings and carvings. By some fluke of nature, she’d been born with a sixth sense when it came to such items. Being able to find them, even in remote and desolate areas, was what had allowed her to get grants and funding for digs. That had led to a teaching position. Her fellow archaeologists might scoff at her area of study, but there was no denying she got results on a dig. She’d been chasing such artifacts all her life. They were like a hum in her blood whenever she was near them. And right now, her blood was practically singing. Whatever was beneath them on the ocean floor was important and rare. The kind of thing men killed for. Aaron scowled, but he did remove his hand. Their employer was not the sort of person you wanted to disappoint. On the surface, Karina Azarov was a rich businesswoman with interests in pharmaceuticals, business, and technologies. Archaeology was her passion, and she often funded expeditions such as this one. She was also a high-ranking member of the Knights of the Dragon, a secret society that had existed for hundreds of years, if not longer. The Integrity was Azarov’s boat and was currently salvaging items from the Reliant, a vessel that had veered off course and sunk during a storm in the mid-eighteen hundreds. It was one of hundreds that had met their doom off the coast of North America over the years. Not really of note to anyone without family on board. It hadn’t been carrying gold or silver when it went down. As far as most people knew it had been a passenger vessel with a small amount of trade goods on board. Only a handful of people knew the ship had been carrying artifacts belonging to the Knights of the Dragon. Members of the secret society had spent millions of dollars and many years chasing the wreckage, but they’d only recently discovered what they hoped were the ship’s remains. Sam nodded but said nothing. Finally Aaron turned and stalked off, allowing Sam to breathe freely once again. The ROV, or remotely operated vehicle, was a godsend in recovery efforts like this. It allowed them to go deeper than a diver could go and to stay down longer. It could also retrieve small or light items. This expedition was well funded, and the ship was outfitted with some of the best equipment available, as well as experienced divers. It was a dream job, or would be if she wasn’t working for some of the nastiest people on the face of the planet. The Knights of the Dragon were obsessed with dragon lore, believing the creatures were real. It was rumored that among the cargo was a scroll or tablet that contained information on how to control one of the mythical creatures. Of course, she wasn’t supposed to know anything about the Knights or their true mission. As far as everyone was concerned, she was an archaeologist here to oversee the authentication of any artifacts. She had to keep it that way. If they knew she was aware of their secrets, she probably wouldn’t make it back to port alive. Sam didn’t believe in dragons. They were interesting and fascinating to study, to be sure, but nothing more than myth. What she did believe in was justice. And the Knights had killed her mentor, the one man who’d taken her under his wing and guided her when other archaeologists and scholars had scoffed at her passion for the mythical, deeming it unimportant. And for what? A book. Brian had stumbled onto a one-of-a-kind leather-bound book detailing the secret society, and they’d killed him in order to get it. Not that she had any proof. The police had called it a home invasion gone wrong. After Brian’s funeral, she was approached by a rare book dealer, Gervais Rames. He’d claimed to know Brian and had told her a crazy story about the Knights and a rival group he claimed to belong to—the Dragon Guard, whose mission was to oppose the Knights and protect dragons. She’d ignored him at first, but unable to let Brian’s death go unsolved, she learned more from Gervais, and her search for answers had led her to this job. She shivered, suddenly colder than she’d been only seconds before. She pulled her coat more securely around her and her black watch cap more snugly against her ears. Turning away from the ocean, she headed back to the cabin. Whatever happened, she was going to make certain the Knights didn’t get their hands on any artifacts discovered. It was the least she could do for Brian. Karina Azarov picked up her silver teaspoon and tapped the expensive silverware against the edge of her crystal wineglass. The murmur of voices lessened and finally stopped. She stared down the table at the dozen other people who had been invited to this meeting. This was the inner circle of the Knights of the Dragon. Some of them, like her nemesis, Herman Temple, were more than a hundred years old, kept alive by the blood of a dragon. But Temple was beginning to show his age. He’d managed to allow the dragon in his care to die and had lost his supply. Dragon blood lost its potency once it was removed from the creature and couldn’t be stockpiled, which was what made dragons so valuable. These were dangerous creatures with a vast intelligence that was not to be underestimated. There were books that contained recipes for potions that allowed them to capture and contain the beasts, incantations and spells that were rumored to do the same. Karina preferred to stick with the potions. That was science, pure and simple. Drugs, heavy chains, and titanium enclosures were their best weapons. Thanks to Temple’s now-deceased son, they’d lost one such valuable book. They’d also lost Darius Varkas, whom they all believed to be a dragon. It had been several weeks since they’d had any real lead on his whereabouts. The trail had gone cold. But he’d have to surface eventually, and when he did, they’d capture him and the little nobody of a librarian who’d stolen the book and tipped Varkas off. The others lifted their glasses and drank. Karina was not moved in the least by his toast. Anton would slit her throat in a heartbeat if he thought it would gain him what he wanted the most—immortality. That’s what they were chasing, the longevity that came from ingesting dragon blood. Karina was ambivalent about the whole idea of living forever, but she figured she’d change her mind when she started to age. She was currently in her thirties, healthy and strong. For her, this was all about power and money. Karina waited until Anton had retaken his seat before standing. “Thank you, Anton. And thank you all for coming.” This was the annual meeting of the Knights. They often spoke over secured lines, or met one-on-one, but having them all together happened only once a year. None of them would dare to refuse to come. “I have located the Reliant.” Voices were raised in disbelief and excitement. Karina remained quiet until they settled down once again. “Are you sure it’s the Reliant?” Jeremiah Dent asked. Dent was a close associate of Temple and, like him, bore watching. Karina was getting tired of being questioned by Temple. “If you’ll be quiet long enough, I’ll share the details.” That shut him up and drew some snickers from other members. No, Temple wasn’t well liked in some quarters. Something to remember in case she needed allies down the road. “I hired Sam Bellamy for the job.” She waited and watched as several members frowned. “Isn’t it dangerous to have her on board?” Temple asked. Temple slowly began to smile. Really, for a man who’d lived as long as he had, he could be incredibly dense at times. But Anton wasn’t. He was watching her, assessing her every move. He’d already figured out what most of the rest of them hadn’t. She was the only one who would have control of the artifact once it was recovered. When it came to moving dangerous artifacts, secrecy was paramount. It was the same now as it had been when the Reliant had gone down. No one knew exactly what the ship had been carrying, only that it had been valuable to the Knights. If it was a book, it might have been destroyed or damaged beyond use after years on the ocean floor. Karina was hopeful that maybe it was a stone tablet or a scroll stored in an airtight jar or some other container that might protect it. She wasn’t sure how much use it would be if it was an amulet or bowl or something of that nature. Either way, destroyed or intact, she’d know and knowledge was always power. Karina discreetly glanced at the diamond studded Piaget that graced her wrist. It had cost more than most people make in a year, but she had a weakness for pretty things and occasionally indulged herself. The expensive watch told her it would be at least another hour before she could get rid of this bunch. Their meeting had run long and they had yet to be served dessert and coffee. A slight movement brought her attention to the door. Birch, her private bodyguard and most trusted man, slipped into the room. He gave his head an almost imperceptible shake to let her know there was no news from the site of the Reliant yet. It could be days before they discovered anything of interest. These things took time. Fortunately she was patient when it came to getting what she wanted.